"The Board of Ed does not even understand the BOCES fees and charges..."
First, participation in BOCES is a state mandate. Back when BOCES (Board of Cooperative Education Services) were first formed in the 1940's, the big 5 cities were excluded and districts were given a chance to opt out. Only one district in Westchester, Mamaroneck chose to opt out. Once that initial decision was made some 70+ years ago, BOCES is like a roach motel. You can check in, but you can never check out. The Board knows full well about BOCES charges. I am not so sure that NCN did an adequate job explaining them as many comments seemed to be based on either incomplete or inaccurate knowledge. BOCES charges are in our budget every year. BOCES is used for many different reasons. One, obviously, are the on-site educational services. They are invaluable to the students and save the district significant amounts of money versus creating our own program for a handful of students. In fact, that is the point. BOCES was set up to be a more efficient and cost effective way to handle certain types and parts of the FAPE (Free and Appropriate Public Education). There appears to be some confusion regarding the annual costs. We are not being charged $2 million (or close to that) for sending a 12 students there. The charges for the 12 students are only part of the overall BOCES costs. We also currently use BOCES for their expertise in certain areas as well as their ability to coordinate and share services inter-district. For example, we are working through BOCES to develop on-line learning opportunities. Through BOCES several Westchester districts are developing on-line courses that will allow districts to share the resources and the expenses of developing the resources. We anticipate being able to increase our course offerings in the future to include on-line classes developed through BOCES that would not otherwise be economically feasible to develop and offer on our own. BOCES is also used as a purchasing co-op for its member districts. We use them to lower the price of certain items and services for the district. In addition, we are able to use (purchase) certain administrative services that we would otherwise not have the need for a full time staff member to do. These purchasing costs are a pass through from BOCES. They will appear on the BOCES expense line because we are being billed by BOCES to pay the vendor, but they are not necessarily BOCES services per se. The district is charged in two ways from BOCES. One, we are charged an annual allocation of administrative and operational costs. Two, we are charged directly for the services we use and the co-op purchases we make. The latter is obvious and easy to appreciate. The former is less obvious. We are required to be part of BOCES. Looked at another way, what would be the affect on the district's budget if there were no BOCES? Would we spend the same, more or less? As I have been told, Mamaroneck's analysis of not being a member is that it is about the same in annual costs to the district as if they were a member. They purchase services a la carte from the Northern and the Southern Westchester BOCES. It is my opinion that you would have to break down the expense into its components. For example, we would clearly spend more on the goods and services we use/buy as part of the co-op buying service. The only time we use BOCES for that now is if it would save us money vis a vis purchasing it on our own. For the educational services provided to the students we send to classes at BOCES, we would spend considerably more without BOCES. Educating one student versus spreading the cost over several or many similarly situated students is prohibitive. The question becomes, does the cost savings from co-op purchasing whether it is goods and services or education related classes out weigh the expense of simply being a member and getting an allocation of annual administrative /operating expenses. There are other costs associated with BOCES that don't show up in the BOCES lines on our budget. For example, the cost of transportation to and from BOCES for our students is part of our transportation costs. And there are cost savings we accrue by being an inclusive district that otherwise would likely be part of BOCES. Educating our students in district within the general population not only is a significant benefit academically and socially to both the students in need of services as well as their classmates without, it is cost savings to the district. The BOCES budget itself, is very similar to its component district's budgets. Most of the cost are personnel related for salaries and benefits. It cannot borrow money itself, so it has not debt service. As a member district, we act as our taxpayers act in relation to our district/board. We can and do demand efficiencies, we expect them to reduce administrative head count in order to lower benefits expense, we expect them to keep plain old administrative operating expenses in check, and we question what are appropriate course offerings. But we are only one member district and our opinion does not always rule the day. There are clearly districts that are much heavier users of BOCES services that derive a much larger benefit from being part of the co-op. Just like Westchester County does not get back tax dollars from the state in the form of services that it pays in taxes, some districts like the CCSD do not benefit as much as others. But, we are mandated to remain part of the system just like residents of Westchester cannot opt out of the State tax system. I don't want to mislead anyone and say that if we were not required to be part, we would withdraw. That decision would take a lot of analysis and prioritizing of what it is that the district wants to provide its residents. The difference though from a non-member and a member in terms of cost really comes to the forefront when there is a cash call for facilities improvements like we are faced with now. Whereas non-members are faced with higher user fees than members for services, non-members are not being asked to help defray the cost of the facilities upgrades and repairs. It is no different than owning an apartment in a co-op building. There are occasionally capital repairs that require the building board to issue a one-time assessment. The Board is certainly aware that our annual administration charges are based on a formula that is 50% a measure of wealth as defined by property values and 50% by number of students in the district. This is actually a change from 100% based on property value wealth that used to be what the formula used. NWBOCES applied for and got an exception from the State of NY to change the formula to 50-50. As part of the annual allocation of expenses, there is a capital cost included. That is supposed to be used for facilities maintenance and the like. I believe that last year we paid $70,000 toward that. It is clear that BOCES has not been doing proper maintenance or proper planning. The majority of what they are asking for is for structural repairs (flat roofs need replacement). This capital call raises many questions independent of how BOCES is operated and expenses shared on an annual operating basis. What was our capital costs used for all these years if there are still millions of dollars in repairs needed? Why weren't these repairs or replacements done periodically to avoid this sort of one time expense? Why was there no replacement plan that could have been discussed with member districts so that we could properly plan ourselves for upcoming costs? Finally, who should pay for facility repairs and upgrades, users, member districts or some combination? Simply put, on a relative basis, relative to other members of the BOCES and relative to our own local education usage, we do not use the facilities anywhere near what most other districts use. Our ~12 students are not a material part of the wear and tear on the buildings. Asking the CCSD to pay for the repairs based on property valuations and wealth vis a vis other districts is a regressive tax on our community members. One suggestion to BOCES at our meeting was to charge users a prorata cost, not member districts. Districts that use services but are not part of our BOCES are not being given an allocation of these costs. Know too that we are not the only district grappling with this issue. A majority of the districts have questioned the surprise nature of the critical need for repairs as well as BOCES costs structure in general. I know of several districts that are meeting again with BOCES prior to their vote to express their displeasure with this situation. One suggestion that seems to be gathering momentum is to reduce the size of the capital request to a bare minimum level needed to keep the facilities operating without upgrade. To clarify, while our district's allocation is about $1.5 million, we would borrow the funds and repay them over time. The annual cost to the district would be around $90,000 according to the administration. If the proposal is voted down by the member districts and we are forced to pay for this on an ad hoc emergency basis, the costs to the district would likely be higher. In fact, Bedford voted yes because of its fear that a no vote would cost more. I have three children in the high school. While that has many implications, it primarily means that I make many trips to the high school each week. One week, I counted 21 individual round trips to the high school. If you drive to the schools enough, you start to notice subtle changes. Since the beginning of the year, I have noticed the flag flying at half-staff almost every time I went to the school. I made a mental note to myself as part of the Facilities Committee to ask Joe Gramando if the flag pole was broken. 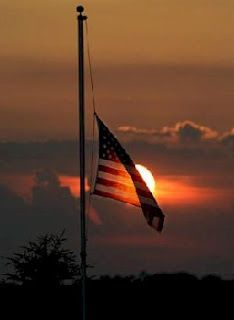 I just assumed it was as the flag was flying at half-staff nearly everyday. When I finally got around to asking Joe if the flag pole was broken, he told me why the flag is flown so often these days at half-staff. The flag has been flown at half-staff in order to honor the men and women who have sacrificed their lives for our country. Other than federal holidays and federal decrees, the flag is flown at half-staff at the order of the Governor. Governor Cuomo, in a change from the prior administration, has ordered state government and school flags flown at half-staff in honor of and in tribute to soldiers, either from New York or stationed at a base in New York, who have died in the line of duty. Unfortunately, there have been many of them lately. Obviously, one is too many, but there have been more than that. The Governor's office sends an email to the district to notify us when to fly the flag at half-staff and why. The emails from Albany include a brief description of the deceased soldier and the action that lead to his or her death. It is quite sobering to read them. If you ever want to know the particulars, you can go to the Governor's website or ask me, I now get copied on the emails. Governor Andrew M. Cuomo has directed that flags on state government buildings be flown at half-staff on Tuesday, November 29 in honor of a Fort Drum soldier who died in Kandahar province, Afghanistan on November 21. "I join with all New Yorkers in mourning the loss of Private Diener and I send my deepest sympathies to his family, friends, and fellow soldiers," Governor Cuomo said. "We will honor the service of this Fort Drum soldier and we will be forever grateful for his dedication to our nation." I join with the Governor in mourning the loss of Private Diener and in sending my deepest sympathies to his family, friends and fellow soldiers. Now, when you drive up to any of the schools in the district and you see that the flag is at half-staff take a moment to remember why it is flown that way, to recognize and appreciate the sacrifices made daily by our soldiers for our country, and to hug your school-aged child who might one day be a United States soldier. Does Bill Clinton Read His School District Website? Noting rural communities like his new hometown of Chappaqua, N.Y., Clinton added: "Every little county has got one bonded contractor. That bonded contractor can guarantee to every public school, every state, county and local building, every little office building ... what the savings are going to be." All the former President has to do is go about a mile down the road from his house to Horace Greeley High School to see this in action. The district recently signed an Energy Performance Contract with Johnson Controls that guarantees that the cost savings from the upgrades to district facilities will pay for the cost of the improvements themselves. Or, over the term of the agreement, there is no net cost to the taxpayer for significant improvements to the district's infrastructure. Maybe President Clinton reads the Chappaqua Central School District website. If he does, he would have seen this article posted to the CCSD site on the energy performance contract. Right here in his adopted hometown we are going green and according to his analysis helping to create jobs! Too bad he doesn't give Joe Gramando, John Chow and the district credit for being an early adapter and proactively green. To support the administration and faculty in their efforts to create a rich and dynamic learning environment that will prepare students to be productive members of an increasingly global community of limited natural resources, the District entered into a long-term Energy Performance Contract with Johnson Controls in July 2011. Basically, an energy performance contract is a financing tool that utilizes cost savings from increased building efficiency and reduced energy consumption to pay for the cost of installing new energy conservation measures - without any up front capital expenses. The contract agreement is for Johnson Controls to guarantee that the savings (plus building aid the District receives from the state) will meet or exceed the annual payments to cover all project costs, and that Johnson Controls pay the difference if at any time energy savings do not materialize. Phase I of the energy performance contract brings improvements to all 6 school building, the Education Center and the Chappaqua Public Library.